Anyways, I have an unopened pack of frozen Angus Cow Beef Tapa in the fridge so thinking about what to cook for breakfast is a no-brainer. Heat a small amount of olive oil in pan and add beef tapa. 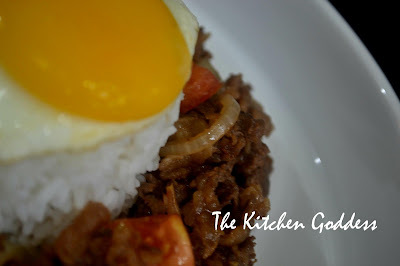 Cook beef tapa until its almost brown before adding tomatoes and onion. Remove from pan after 3 minutes or less, making sure not to overcook tomatoes or unless you want it cooked and juicy like I do. Transfer to a plate and serve with egg. No need for vinegar as the tomato lends its flavor.